See our 2014 Oscar Coverage! When asked what movies I’d be seeing at the festival, even though I’m seeing 14 in total this is always one of the first I mention. I was introduced to Mads Mikkelsen as an actor in Casino Royale, but as an artist in 2009 when I saw both Valhalla Rising and Coco Chanel & Igor Stravinsky in 2009. I’ve been a devotee ever since, and was overjoyed to hear that he’d be back at TIFF, and bringing such challenging subject matter as in Jagten/The Hunt. Simply, The Hunt is the story of a kindergarten teacher in a very small town, accused of molesting a student. I assumed that I would be seeing a story of ambiguity and mystery, instead they gave us the answer to the question of his innocence very early on, to set it aside, so that we could discuss what happens to a man when everyone turns on him. It’s very hard to really discuss the movie without spoilers, so be warned that I do examine the ending in detail. Mads’ character Lucas is unquestionably innocent. What starts as a child’s pettiness over a perceived slight grows into a life-ruining catastrophe. When your daughter accuses your best friend of touching her, with whom do you side? We must, must always listen to children and give them the benefit of the doubt in such terrible cases, but it can and does happen that false accusations are made. 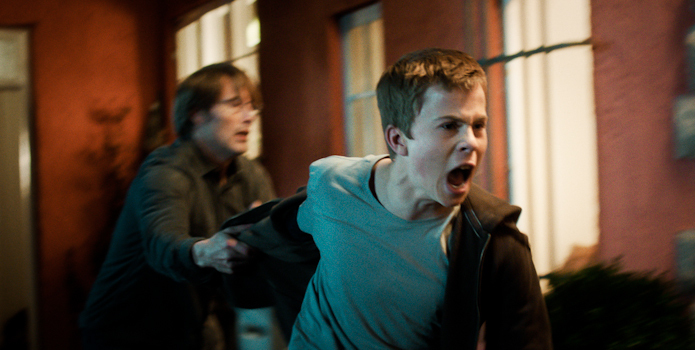 In such as small town as the setting of the movie Lucas finds himself isolated and under attack immediately. Any doubt as to the truth of the matter is thrown away out of the desire to protect the students at the kindergarten. Parents, fearing the worst, question their children so specifically that all to soon copy-cat reports are made and Lucas is arrested. He is a very quiet and lighthearted man, and while he does seek to defend himself he is not a reactionary person. Contrasted with his neighbours who begin to systematically ostracize and terrorize him. Through it all Lucas is seeking custody of his son, which is endangered when his boss feels it necessary to inform the mother of the investigation. The story is one of reaction and mistakes, of assumptions and isolation. Lucas loses almost everyone in his life, and it is only through the efforts of his son’s godfather that he is released from prison. The story cannot be proved, and the false memories of the children are directly contradicted by the truth to Lucas’ life. But his community believes that a monster has been released in their midst. Lucas is not the ‘hero’ of the story, merely a man upon whom fate is acting, but his neighbours assign themselves the heroic role and Lucas is nearly killed as a result. It is very hard to watch. I felt deeply unsettled and have never hoped so fervently for a happy ending to a film. When, at the end, Lucas is exonerated and accepted back into the community there is a sense of hope. He is reunited with his friends and they initiate Lucas’ son into their family of game hunters. Lucas goes into the woods and has a moment of peace he likely thought would never come again, just before a shot rings out, nearly missing him. Another hunter, their identity blocked by the sun, had taken the shot, just missing him. And while a nearby deer makes its escape Lucas, deeply shaken, knows he may have been the target of a warning shot rather than poor aim. No matter what people say, somone, possibly a few people, still doubt his innocence. All is not forgiven and certainly not forgotten, but the small town is Lucas’ home and he stays in the place that he loves. But life does not give us re-set buttons. Old hurts remain buried under the surface and some people do not ever forgive. The final scene of the movie is a violent reminder to Lucas that he will always be judged, always found wanting, and can never truly feel safe again. 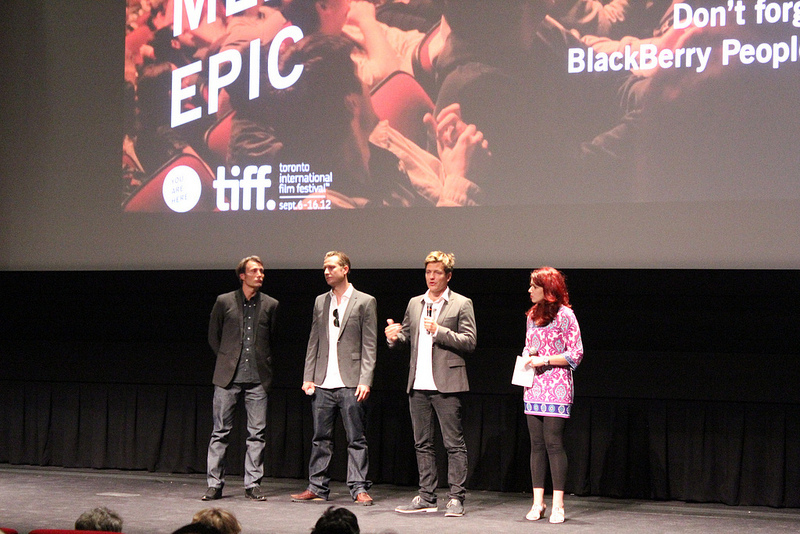 The Q&A was a bit frustrating for this film. More than a few people asked for the movie to be explained to them, to be told for sure whether or not Lucas committed the crime (answer from the director: he did not). But more of them wanted to argue with the director over the ending. I could hear a touch of defensiveness in Mads’ voice as he answered some pretty inane questions. They either wanted to argue that room for doubt should have been left, or even that it had been left and they weren’t sure what had happened Worst of all was the moderator who asked if we can be completely sure that Lucas did not commit the crime (did we not watch the same film??). But director Vinterberg did a wonderful job explaining why Lucas’ innocence needed to be unquestioned – how else could we relate to and sympathize with the main character if we question him? It needed to be obvious, and then set aside, to tell the story he wanted to tell. The movie where Lucas is a mystery is a different story altogether and one that has been told before (Hard Candy comes to mind). I believe that The Hunt worked, that it tackled a terrifying subject matter with grace and boldness. There was no need for added mystery, just sympathy for all of the characters. Even the ones most abusive to Lucas were acting out of what they considered to be the public good. Even the mysterious hunter at the end is only trying to protect family from what he thinks is a monster in their midst. 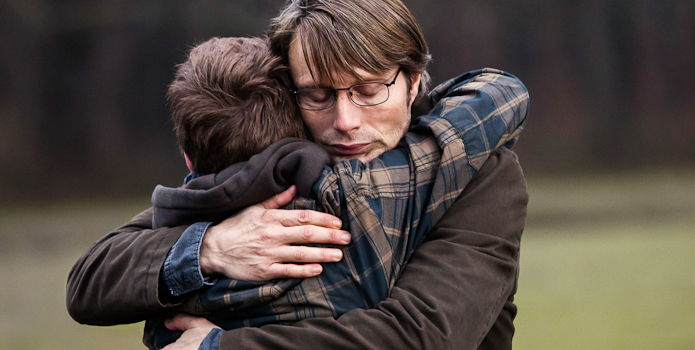 As Mads said perfectly, this is a story of how great love can become great fear, and in turn to great hate. Any community can be rocked in this fashion, which is why this story needed to be told.